White House Press Secretary Sarah Sanders has confirmed U.S. troops are being withdrawn from Syria, after President Donald Trump on Wednesday said the Islamic State (IS) had been "defeated" in the war-torn country. The decision by Trump to pull out the 2,000 U.S ground troops out of Syria follows a phone call between Trump and his Turkish counterpart Recep Tayyip Erdoğan on Friday, a U.S. official told Reuters, noting "Everything that has followed is implementing the agreement that was made in that call." “We have defeated ISIS in Syria, my only reason for being there during the Trump Presidency,” Trump said in a Twitter post on Wednesday morning while offering no details on his plans for the military mission in Syria. White House Press Secretary Sarah Sanders on Wednesday released a statement regarding the U.S. withdrawal, noting that the U.S. victory over ISIS in Syria does not signal and end to the global campaign against the organisation. “We have started returning United States troops home as we transition to the next phase of this campaign. The United States and our allies stand ready to re-engage at all levels to defend American interests whenever necessary, and we will continue to work together to deny radical Islamist terrorists territory, funding, support, and any means of infiltrating our borders,” Sanders said. Pentagon officials as late as Wednesday were still trying to convince Trump that such a move would betray Kurdish allies who have fought alongside American troops in Syria and who could find themselves under attack in a military offensive now threatened by Turkey, it said. The move the by the U.S. arrives days after Turkish President Recep Tayyip Erdoğan announced that Turkey would launch a new offensive against the Kurdish People’s Protection Units (YPG) in northeast Syria, which the United States has equipped to fight the Islamic State in Iraq and Syria, in a decision further risking political tensions with the United States, which opposed the move. Ankara sees the YPG as an extension of the Kurdistan Workers Party (PKK), which is designated as a terrorist organisation by Turkey, the European Union, and the United States. However, the YPG form the backbone of a U.S.-led offensive against the Islamic State (ISIS) in Syria. Washington reportedly maintains a military presence of around 2,000 troops in the region. Abandoning the YPG in the region will hamper future efforts by Washington to gain the trust of local fighters, from Afghanistan to Yemen to Somalia, according to Pentagon officials. 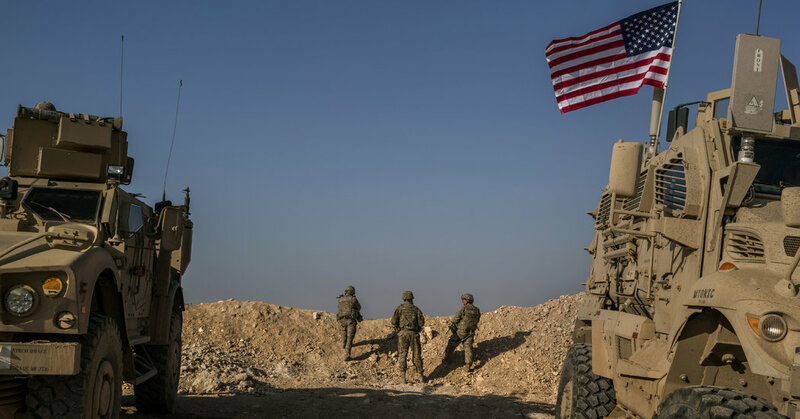 Withdrawal of U.S. troops from Syria was a promise Trump made during his presidential campaign with him giving a reluctant green light to the Defense Department more time to finish the mission in April. There has been a debate brewing in the White House, the New York Times underlined, over withdrawing from Syria and the risk of the threat to U.S. forces a likely Turkish incursion could bring. The Islamic State has lost roughly 90 percent of its territory in Iraq and Syria, where the 2,000 American troops are mostly advising a militia comprising Kurdish and Arab soldiers. Israeli Prime Minister Benjamin Netanyahu on Wednesday said US President Donald Trump had assured him that the U.S. will continue to influence events in Syria, the Times of Israel newspaper reported. “I spoke with US President Donald Trump and yesterday with US Secretary of State Mike Pompeo, who told me that it was the president’s intention to withdraw their forces from Syria and made it clear that they had other ways to express their influence in the arena,” it quoted Netanyahu as saying. Wednesday's announcement was met with mixed reactions by U.S. officials and analysts. Dana W. White, Assistant to the Secretary of Defense for Public Affairs, on Wednesday reiterated that despite the U.S. withdrawal from Syria, the campaign against ISIS continued. "The Coalition has liberated the ISIS-held territory, but the campaign against ISIS is not over...We will continue working with our partners and allies to defeat ISIS wherever it operates," she noted. Republican Senator Marco Rubio also addressed the U.S.' “full and rapid” withdrawal from Syria, noting the decision was a mistake. “The Syrian Democratic Forces and YPG will now abandon the fight against ISIS in the Middle Euphrates River Valley. Iran will step up activity in Southern Syria, which will elicit increased Israeli strikes that could lead to a new and far deadlier Israel-Hezbollah war,'' he said, adding that the adversaries of the United States will use this as evidence that Washington is an unreliable partner. ''Today’s decision will lead to grave consequences in the months and years to come,” Rubio stressed. American political scientist Ian Bremmer was also among those who criticised the decision, pointing to the ramifications of the move on U.S.-backed Kurdish militants in the region. ''The US has a long tradition of disappointing the Kurds,'' Bremmer posted on Twitter. The president overruled his military and diplomatic advisers, who warned against abandoning Kurdish allies and ceding influence in Syria to Russia and Iran.